Rarely can two consecutive Saturdays have shown such a contrast. From last week’s wet, cold, muddy debacle of dropped catches, crap bowling and even worse batting, to a thoroughly professional batting, bowling and fielding display in glorious sunshine in the Surrey Hills at Abinger. If last week made one wonder why we wait for six months of off season, desperately looking forward to the cricket season starting, then this Saturday showed us why. Losing the toss and being asked to bowl in 27 degree heat would usually be a recipe for disaster, but fresh on the back of last week’s batting disaster at Richmond it was perhaps for the best that our hosts got first use. It also left us the option of blocking the living daylights out of it after tea, should the wheels have completely fallen off. The new ball partnership last seen in 2007 were reunited like some sort of money-grabbing 80s synth-pop band. All of the greatest hits were still there, Clifford jagging the ball around and Balasoglou keeping both the batsman and keeper guessing with his variations in line and length, (and fine leg, and slip, and third man, and at times gully). Clifford made an early breakthrough via a drag-on, but otherwise it was slow going on the predictably true surface at Abinger, although first change bowler Santosh perhaps showed the way forward as he took the pitch out of the equation and yorked their number 3. Still, Abinger made serene progress, built around the excellent innings of Dylan Edwards who fed on anything short or wide (in fairness, for once there wasn’t a huge amount of this) to pepper the square boundaries with cuts and drives. 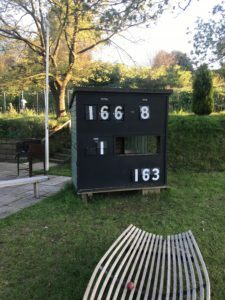 Corinthians continued to chip away at the other end, with the returning Amit Khare marking his first game in three years with a brace of wickets, first a stone dead lbw and two balls later bowling Josh Burt in unfortunate fashion as the batsman’s forward defensive somehow bounced back onto the stumps via pad, bat and pitch. At this point Abinger were 61-4 and Corinthians were dreaming of an early finish. That said, Abinger had already scored nearly twice what we did at Richmond, so perhaps an early finish was guaranteed no matter what. But Abinger had other ideas, as Edwards found support in Chris Churchley and set about compiling a partnership of 69 off the back of our back up bowling. Eventually the skipper decided it was time to take matters into his own hands, brought himself into the attack and immediately lured Churchley into Santosh’s surprisingly safe hands at mid on. From there Corinthians took complete control. The Clifford combined to dismiss Edwards (90) just as he would have been thinking of a century and then the world’s most unlikely death bowler Theo Moore picked up the remarkable figures of 5-2-7-3 at the death. 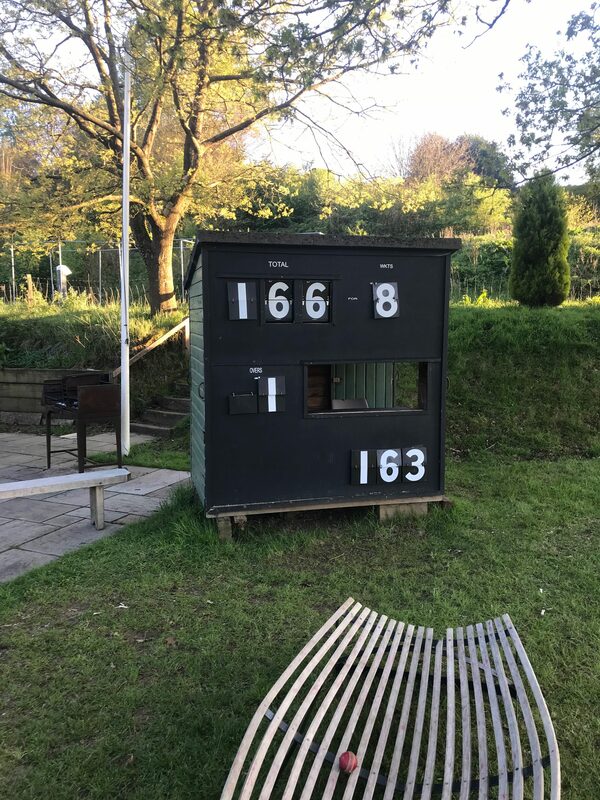 Abinger finished on 162-9 from their allocation, it would have been 4-5 less had the final over not featured some of the more amusing efforts your correspondent had seen at a) batsmen running b) fielders attempting to run out said batsmen. But surely those couple of runs wouldn’t make a difference. After a typically excellent tea, Corinthians set about their task with Clifford jr opening the batting with Sumit, however despite both starting in positive fashion, they both ultimately paid the price and perished caught and bowled by their mystery spinner. This cleared the dancefloor for Waqas Gujjar, on debut and batting at three. His twelve balls were probably some of the more memorable balls that anyone has ever faced on debut, and the fielder’s comment “Well, he clearly goes to the gym” were well placed, as Waqas peppered the straight and square boundaries before being perhaps unfortunate to be adjudged lbw to one that looked both high and leg-sided. This brought a little wobble, as captain Chandra was undone by a good nut from the excellent Charlie Robertson, who as usual spent his Saturday launching himself down the hill at full tilt whilst his teammates gently floated them up at the other end, and then Manik played all around one and was lbw. This brought togther Clifford snr and Matthew Simpson at 48-5 with 115 still needed and nearly 2 hours of cricket left. This allowed both the licence to “play their natural game” as Matthew took the sting out of the attack with solid defence and sensible accumulation, whilst Clifford swung for the hills. This approach paid dividends, as the target was kept below 6 an over and the short boundaries allowed both men to up the rate whenever some pressure began to build. As we approached the last 10 overs, 60 were needed and Abinger were in need of something special, so their captain turned to Edwards whose 90 had set their platform. He again delivered the goods, firstly by dismissing Simpson with an offbreak which neither turned, nor bounced and instead hit him on the ankle in front of middle stump. He’d count himself unlucky, had the previous three balls not done exactly the same thing. Then, in the following over, Clifford was caught in the deep, in explicably trying to clear the long leg side boundary. Suddenly 44 were needed in 7 overs and the game had taken a rather different complexion. Amit joined Theo in the middle, and while some may have considered showing some discretion to bat out for a draw, Theo had other ideas as firstly he attempted to swing himself off of his feet every ball he faced, and then brought out my personal highlight, which was the attempted reverse sweep which he nailed straight to backward point for no run. Eventually Theo perished, trying to swing their opening bowler over midwicket for six (it was that sort of afternoon) and Santosh was at the crease. You’d think Santosh would have been nervous, but he was at least two pints of Fosters’ deep at this point, so was surprisingly serene. 151-8. Two and a bit overs left. 15 needed. Geoff at number 11. All four results possible. Amit was on 20 and playing extremely responsibly, certainly compared to the chaos around him. Things get sketchy from here on in. One went through backward point to the long boundary for four. Santosh lofted a remarkable shot over extra-cover (from their opening bowler?) for four. We got to the last over with 7 needed, Amit on strike and their mystery spinner to bowl. Geoff still having kittens. First ball swung away behind square on the leg side by Amit. Good fielding in the deep but they “race” back for two. Second ball, short, wide, carved away to backward point where excellent work keeps us to one. Third ball, Four needed to win, Santosh on strike, swing, miss, missed stumping! Fourth ball, three needed to win, short and wide again, crunched to deep cover where again excellent fielding keeps us to one. Fifth ball, two needed to win, Amit back on strike, short, pulled to deep cow corner on the bounce, but only a single! Last ball, scores tied, Santosh on strike, SMASHED past the bowler, into the river for four. Remarkable win, given the quality of the opposition, and also the quality of of own performance, particularly in view of our “performance” last week. Thanks as always to Abinger who are great hosts with a lovely, lovely set up.